As an acronym, DSR sounds like a tabletop RPG publisher. And spelled out in words, as Dynamic Super Resolution, it only gets worse. But the refined downsampling tech from Nvidia can pull a sharper image from your PC without even an evening spent in set-up. It deserves a wider audience, and that’s what it’s getting. If you own a GeForce GTX 400, 500, 600, 700 or 900 Series graphics card, you’re now in a position to benefit. DSR was first introduced alongside the GTX 980 and 970. Designed to enable 4K-quality graphics on any HD screen, it’ll render compatible games at a higher resolution, before filtering the image back down to an appropriate size for your monitor. Downsampling can enable exactly the same thing, if you know what you’re doing – but what NVIDIA have done is reduce the process to a one-click affair in their GeForce Experience software. If you own a compatible card, you’ll want to click the wrench icon in the GeForce Experience window to select a DSR resolution. More detailed choices for scaling factors and softening the image can be found in the NVIDIA control panel. The only potentially fiddly stage is HUD and UI scaling. Some games will resize to match your resolution; others, like WoW, have an option buried in their menus. 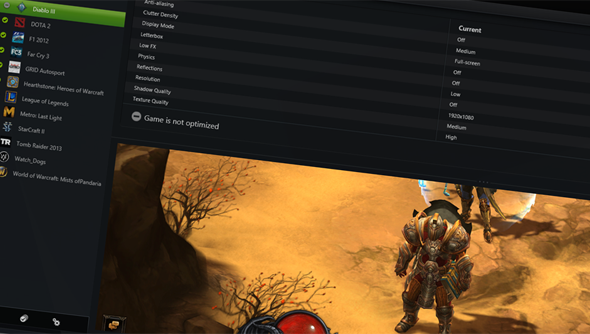 But still others will require config file modifications, like those you’ll read about on the PC Gaming Wiki. You can download Nvidia’s DSR software as part of their new Game Ready 344.48 WHQL drivers. Do you think you might? Here’s more on Nvidia’s plan to live up to their rather sniffy slogan: The Way It’s Meant to be Played.